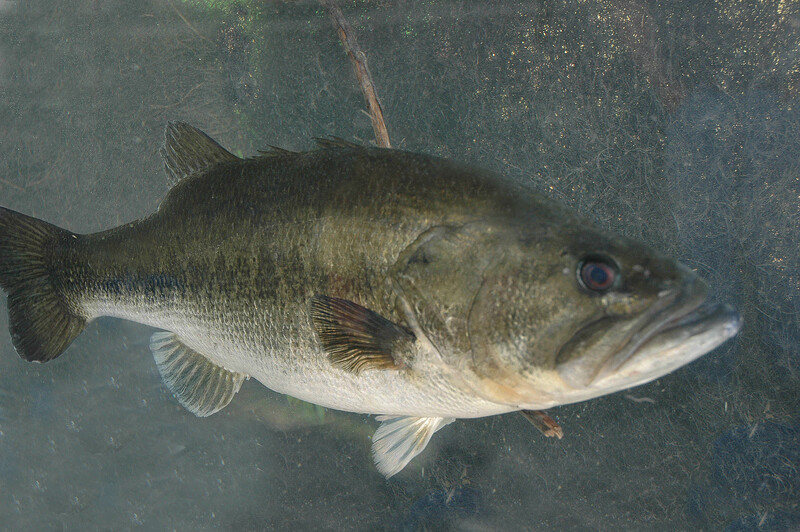 Fishing down the riprap early in the morning in water only 1 to 2 feet deep, you may be surprised at the size of November bass you can catch on Maynor Creek. 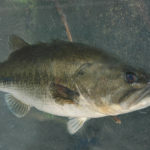 Maynor Creek holds some 8- to 10-pound bass, and during much of the summer, they’ve probably been holding deep in the grass but can be caught once the grass breaks up some. 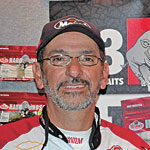 I’ll use a wide variety of lures that I’ve got rigged on several rods on my casting deck. When I launch my boat, I’ll motor to the north end of the lake where a road on a small bridge crosses the water. There’s riprap on both sides of the bridge, and I’ve identified this site as one of the best places to fish early in the morning. The two points of the riprap on either side of the bridge create a funnel for bass to move in and out of the shallow water. I always can catch several good bass there early. First, I’ll fish a pearl/white Mann’s Reel ’N’ Shad on a ¼-ounce jig head on a 7-foot-2, medium-heavy Shimano rod with a 7.2:1 Curado baitcasting reel spooled with 20-pound White Peacock fluorocarbon. I’ll start where the riprap makes a point under the bridge and fish down both sides of that point, making long casts. I’ll reel the Reel ‘N’ Shad in that very shallow water next to the rocks where bass will be actively feeding on shad. When I’m 30 to 50 yards down the riprap, I’ll turn my boat around and fish a Mann’s Baby 1-Minus in grey ghost fairly fast on the same shallow side of the riprap back to my starting point, using a 6-foot-10, medium-action Shimano rod and a reel with 20-pound line. Once I reach my original starting point, I’ll put the Baby 1-Minus down and fish the Reel ‘N’ Shad around the other side of the point and then change out to fish the Baby 1-Minus back to my starting point. Next, I’ll cross under the bridge to the riprap on the other side and follow that same procedure with the same lures. After I fish the riprap on both sides of the bridge, I’ll put my trolling motor down and fish all the shallow water on the north end of the lake above the bridge. I’ll be keying in on the patches of lily pads and other cover I spot close to the bank with a ¼-ounce black buzzbait. I’ll be fishing it on 30-pound braid on the same 7-foot-2, medium-heavy rod and 7.2:1 reel everywhere I can fish around broken patches of lily pads. Maynor Creek holds many big bass, and you may catch an 8- to 10-pounder. 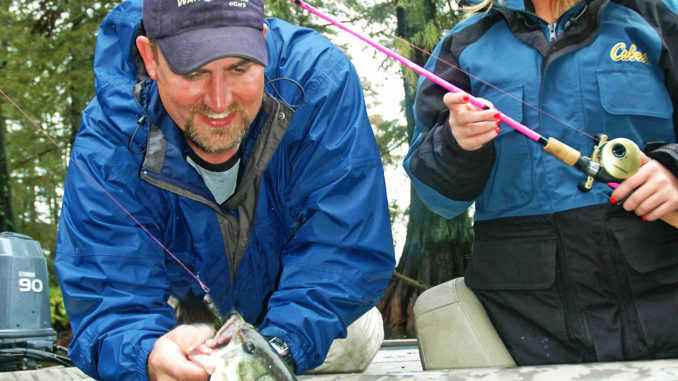 There also seems to be an abundance of 3- to 5-pound bass. I mainly use the buzzbait to cover a lot of water quickly. Where I find an open patch of lilies, I’ll fish that Baby 1-Minus, throw the Reel ‘N’ Shad and still have a rod rigged with a buzzbait. I’ll fish each lure where I can. When there’s plenty of daylight, I’ll be fishing a Super Frog around the thicker lily pads where I can’t fish the other baits I’ve been using. Early in the month, the vegetation won’t be as broken up as it will be late in the month. If I’m fishing in early November, I may start above the bridge with the Super Frog on 50-pound braid on a 7-foot-6, heavy action rod and the same 7.2:1 reel. Later in the month, I’ll fish the buzzbait there first. The Super Frog won’t be as effective at the end of the month. As the sun climbs higher, you’ll see schooling bass breaking the surface all over the lake. I’ll leave the shallow water, go to the main body of the lake and search for schooling bass in the mouths of pockets, fishing the Reel ‘N’ Shad and the Baby 1-Minus, especially when bass are breaking on the surface and feeding. Once the bass go down, I’ll fish a ½-ounce Little George and work it the same way I’d work a jig or a plastic worm: let it fall to the bottom, pump it up off the bottom and allow it to fall back. I’ll also fish a 6-inch Mann’s finesse worm on a drop-shot rig where I’ve seen schooling bass breaking the surface earlier. 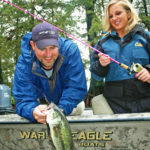 In November at Maynor Creek, you can catch numbers of good-sized bass — possibly 15 to 20 in a day of fishing — that weigh from 1 to 10 pounds each, once you determine where a school of bass is holding. Also, fish for bass that you can’t see breaking on the surface in that same area. You may have a good number of 3- to 5-pounders in that one day’s catch. Maynor Creek has made a comeback, and at this time of year, fewer people will be on the water.